A market correction in the fourth quarter, spurred by a number of global macroeconomic concerns and rising interest rates ended up having a negative impact on the markets and many hedge funds as a result. The stocks of smaller companies were especially hard hit during this time as investors fled to investments seen as being safer. This is evident in the fact that the Russell 2000 ETF underperformed the S&P 500 ETF by nearly 7 percentage points during the fourth quarter. We also received indications that hedge funds were trimming their positions amid the market volatility and uncertainty, and given their greater inclination towards smaller cap stocks than other investors, it follows that a stronger sell-off occurred in those stocks. Let’s study the hedge fund sentiment to see how those concerns affected their ownership of Trimble Inc. (NASDAQ:TRMB) during the quarter. Trimble Inc. (NASDAQ:TRMB) shares haven’t seen a lot of action during the third quarter. Overall, hedge fund sentiment was unchanged. The stock was in 17 hedge funds’ portfolios at the end of the fourth quarter of 2018. At the end of this article we will also compare TRMB to other stocks including Targa Resources Corp (NYSE:TRGP), Camden Property Trust (NYSE:CPT), and Albemarle Corporation (NYSE:ALB) to get a better sense of its popularity. We’re going to view the latest hedge fund action regarding Trimble Inc. (NASDAQ:TRMB). How are hedge funds trading Trimble Inc. (NASDAQ:TRMB)? At the end of the fourth quarter, a total of 17 of the hedge funds tracked by Insider Monkey were bullish on this stock, a change of 0% from the previous quarter. By comparison, 20 hedge funds held shares or bullish call options in TRMB a year ago. With hedge funds’ sentiment swirling, there exists a few notable hedge fund managers who were adding to their holdings considerably (or already accumulated large positions). 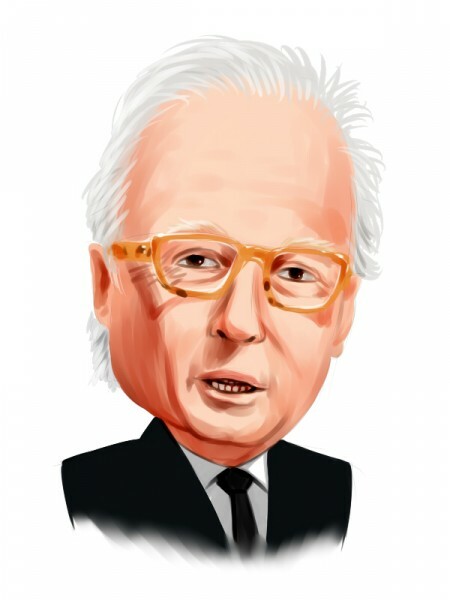 According to Insider Monkey’s hedge fund database, Ian Simm’s Impax Asset Management has the number one position in Trimble Inc. (NASDAQ:TRMB), worth close to $183 million, accounting for 3% of its total 13F portfolio. Coming in second is Select Equity Group, managed by Robert Joseph Caruso, which holds a $170.9 million position; the fund has 1.3% of its 13F portfolio invested in the stock. Some other hedge funds and institutional investors that hold long positions contain D. E. Shaw’s D E Shaw, Peter Muller’s PDT Partners and Israel Englander’s Millennium Management. Because Trimble Inc. (NASDAQ:TRMB) has experienced a decline in interest from hedge fund managers, it’s easy to see that there lies a certain “tier” of funds that elected to cut their positions entirely in the third quarter. Interestingly, Ken Griffin’s Citadel Investment Group dumped the largest investment of the 700 funds tracked by Insider Monkey, valued at close to $5.3 million in stock. Paul Tudor Jones’s fund, Tudor Investment Corp, also dumped its stock, about $2.3 million worth. These bearish behaviors are important to note, as aggregate hedge fund interest stayed the same (this is a bearish signal in our experience). Let’s check out hedge fund activity in other stocks similar to Trimble Inc. (NASDAQ:TRMB). We will take a look at Targa Resources Corp (NYSE:TRGP), Camden Property Trust (NYSE:CPT), Albemarle Corporation (NYSE:ALB), and Amdocs Limited (NASDAQ:DOX). All of these stocks’ market caps are closest to TRMB’s market cap. As you can see these stocks had an average of 26.5 hedge funds with bullish positions and the average amount invested in these stocks was $401 million. That figure was $494 million in TRMB’s case. Targa Resources Corp (NYSE:TRGP) is the most popular stock in this table. On the other hand Camden Property Trust (NYSE:CPT) is the least popular one with only 19 bullish hedge fund positions. Compared to these stocks Trimble Inc. (NASDAQ:TRMB) is even less popular than CPT. Considering that hedge funds aren’t fond of this stock in relation to other companies analyzed in this article, it may be a good idea to analyze it in detail and understand why the smart money isn’t behind this stock. This isn’t necessarily bad news. Although it is possible that hedge funds may think the stock is overpriced and view the stock as a short candidate, they may not be very familiar with the bullish thesis. Our calculations showed that top 15 most popular stocks among hedge funds returned 21.3% through April 8th and outperformed the S&P 500 ETF (SPY) by more than 5 percentage points. 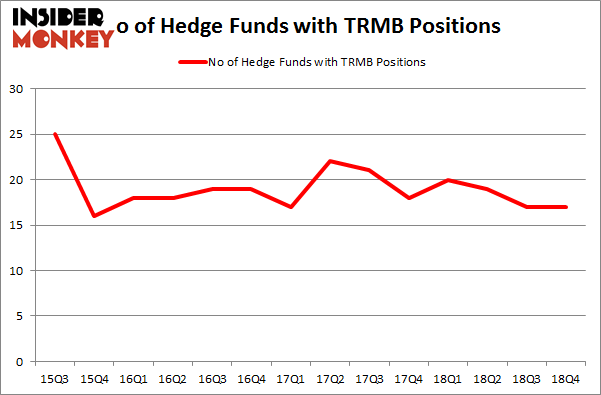 Hedge funds were also right about betting on TRMB as the stock returned 24.1% and outperformed the market as well. You can see the entire list of these shrewd hedge funds here.